This is an informal portrait of William Coffin Colemen, 1870-1957, shown experimenting with an early lamp. 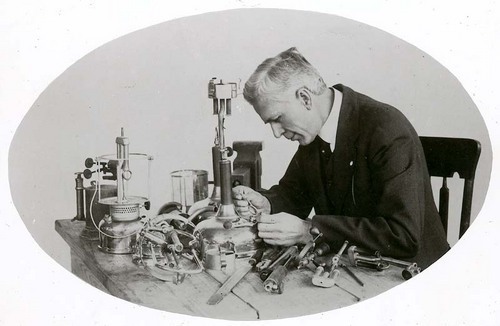 In 1901, Coleman moved to Wichita, Kansas, where he started the Coleman Lamp and Stove Company. During World War II, Coleman stoves became a revered item for thousands of G.I.s fighting overseas. Today, they have become commonplace to millions of campers.